Our website provides neighborhood news and photographs, links to local information sources, access to documents and forms used by the Homeowners Association and more. Some areas of the website are restricted to resident/member use only and require registration. Other sections provide information useful for residents and guests alike. Please contact us with your feedback and/or if you would like to volunteer to help expand the site with new functionality and content. Thank you! 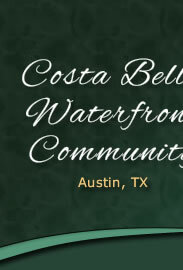 The Costa Bella Waterfront Community HOA Board of Directors.